This is my weekend to work, so I am off today. I always enjoy these middle-of-the-week days off, but unfortunately they always lead to an unpleasant succession of work days; this time around, it will be Thursday through the following Friday - nine days. Since my heart attack one month ago, I have made some pretty radical changes in my lifestyle. Ironically, most of them are changes I have been wanting to make for a long time, but felt overwhelmed with facing. I had tried to make headway with a few of them in recent months/years, but had never really gotten anywhere on a long-term basis. In short (and literally overnight), I have given up caffeine, nicotine, junk food/processed foods, and virtually all meat. I have also begun going to bed at a normal hour, rising at a normal hour in the morning, and exercising on a regular basis. At my weigh-in last Saturday, I was down about 20 pounds from my pre-heart attack weight of 250 pounds. I haven't been in the low 230's since about the time I started radiography school in 2007. My doctor has advised me to "get below 200 pounds," so I still have a long way to go. I haven't been below 200 pounds since college. Me, in October 1995, age 20, weight probably 180. Caffeine: I have replaced coffee and all soft drinks, diet or otherwise, with Perrier. Perrier and tap water, in fact, are pretty much all I drink, except for an occasional glass of vanilla soy milk. I've found that Perrier is a fantastic substitute for soft drinks, mimicking the fizz, but not containing the caffeine and chemicals. Nicotine: I had quit smoking tobacco in late December, but had replaced tobacco with e-cigarettes, which deliver nicotine in a vapor mist. Though I was no longer inhaling the carcinogens and other toxins associated with cigarette smoke, I was still ingesting and remaining addicted to nicotine, and was probably using nicotine even more heavily, because I used the e-cigarette more often than I ever smoked real cigarettes. My cardiologist advised me that even without the cigarette smoke, the nicotine was harmful for my heart, so I gave up e-cigarettes as well. In the case of both caffeine and nicotine, I gave both vices up cold turkey. Strangely, with the exception of a brief period of severe irritability about 48 hours after my last cigarette, I never missed smoking and have never had even a moment of temptation to indulge. I did crave a cold can of Coke almost the entire time I was in the hospital, but by the time I got home, I was over the caffeine as well. Meat: I have always liked the idea of vegetarianism and have "flirted" with it for a few weeks at a time in the past, but I had never been able to make it stick. I think I made it three months in 2010, and actually lost quite a bit of weight, but then I ended up falling off the wagon. In any case, I have not gone to total vegetarianism in the wake of my heart attack, but what I like to call "virtual vegetarianism." I am eating heart-healthy fish twice a week, and on a couple of occasions over the last month I have eaten small portions of grilled chicken, but I have given up pork and beef completely. I'm not saying I'll never eat pork or beef again, but my intention is to make it a very rare indulgence. There is simply too much sodium, saturated fat, calories, and cholesterol in most red meat products. Junk food/processed food: Anyone who knows me knows that I ate a lot of crap in the past. Not just unhealthy foods, but large quantities of them. I was, in fact, pretty much a binge eater. Pizza, fast food, chips, ice cream, cookies, sugary soft drinks, microwave snacks - these were all regular, staple foods for me. In fact, many of them had become (without me even quite realizing it) comfort foods. I especially enjoyed coming home from work in the late evenings, stopping for 12 dollars' worth of Taco Bell, or fixing myself three cheese covered, frozen burritos at home with a side of half-a-box of Cheez-Its, pounding away a few thousand calories, washing it down with a Mt. Dew, and topping it off with four or five cigarettes on the porch. Obviously I can't do that anymore if I want to stay healthy and alive. Giving these things up was, and continues to be, significantly more difficult than quitting smoking. I can't say that I have completely and totally given up all junk food all the time, but - like meat - I have made it something that I only eat in small portions on infrequent occasions. For instance, I might eat some Cheez-Its or pretzels when I come home from work. But for the most part, I either eat no junk food or processed food at all, or I buy "healthy" junk food. For instance, I have been buying low fat, low sodium popcorn or kettle chips, whole grain cookies from the organic aisle, or sweet potato and radish chips. A few weeks ago, when the family went to LaRosa's, I ordered the "skinny" pizza with veggie toppings - only 100 calories per slice or something. What it boils down to is that I have started making fruits and vegetables, either eaten whole or juiced/blended, as well as whole grains and nuts, the main substance of my daily diet. 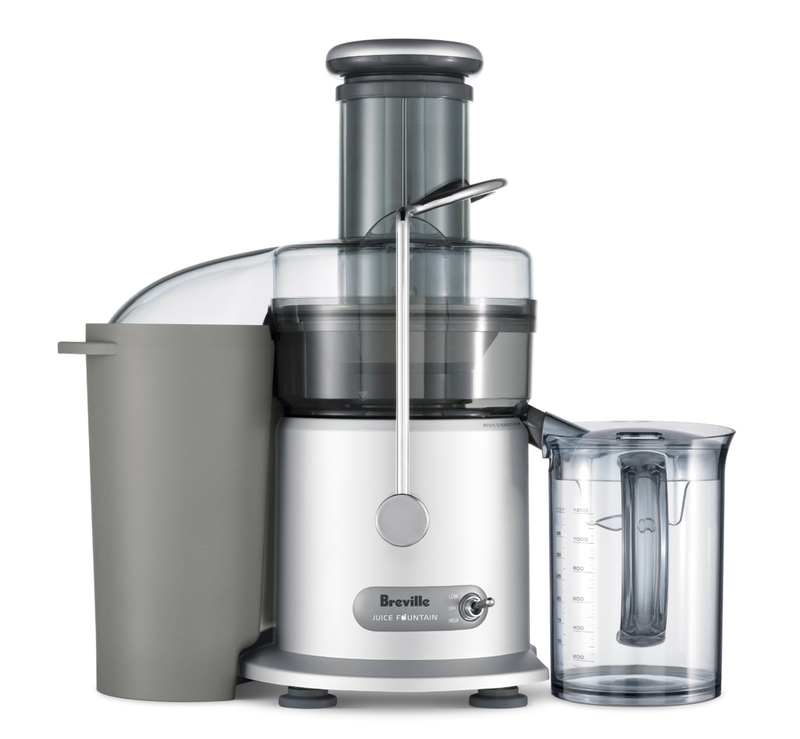 I've been using this Breville juicer to increase my daily intake of fruits and vegetables. The resulting juice is pretty good as long as you use enough fruit to sweeten it. It's also very densely packed with nutrients. I have dramatically increased my fiber intake, as well as lowering my sodium and increasing my vitamins, minerals, and heart-healthy nutrients. I have lowered my overall caloric intake, and (with the exception of heart-healthy fish) I have made meat and junk food a very rare indulgence. Some things - like fast food, processed baked goods (think of Little Debbie or Hostess), soft drinks, ice cream, and most chip brands - I have given up entirely. I have also stopped my very, very bad habit of not eating breakfast or lunch, and then eating very large dinners and very large late-night meals. I now eat three square meals with healthy snacks in between. Exercise: I had been trying to turn over a new leaf on the exercise front since the beginning of the year; hence, the reason I was biking just before I had my heart attack. Since the heart attack, I have not yet had the courage to get back on my bike, but I have resumed doing push-ups and sit-ups, which I had been doing earlier in the year, and I have also started walking on a daily basis. I have been doing brisk, 45-minute walks through my very hilly neighborhood. I have been thinking about the possibility of buying a treadmill and free weights as well, or perhaps joining the gym at the hospital where I work. Sleeping: As with eating, anyone who knows me knows I had terrible sleep habits. Working second shift, I routinely stayed up until 3 or 4 in the morning, then would frequently sleep sitting on the chair in the family room, stay sleeping until noon or later, before finally getting up, taking a shower, and going to work. On weekends or when I had the following day off, I might stay up until dawn and sleep until the afternoon. I took naps all the time. I now go to bed within an hour (usually less) from the time I get home in the evenings. I set my alarm every morning for 9:00 (which gives me well more than eight hours of sleep). I have taken maybe two naps since getting out of the hospital. Together with the dietary changes and the exercise, this normal sleeping habit is now easy for me to do and I sleep well at night. I haven't slept a single night on the chair or couch. As a result of all of this - diet, exercise, and sleep - I feel better now, one month removed from a completely unexpected heart attack at age 38, than I have felt in years. I have more energy, I feel better about myself, I feel more motivated, and I feel less stressed out. I feel that my mood and demeanor is much more stable and less up and down. In addition to losing weight and feeling physically and emotionally better, I have noticed that my infamously shaky hands are not nearly as shaky as they used to be. When I was observing my hands the other night at work, even my coworkers agreed that I have not been shaky like in the past. I don't know if this is the result of better nutrition, less stress, or better sleep - or all three - but it's a pleasant surprise because I have always been embarrassed by what my doctor had said was a "benign tremor" in my hands (not to be confused with a "benign tumor"). As I have noted before, I had started trying to change some of my bad habits back in January. Motivated by having quit cigarettes in late December, I decided to start packing my lunch more often and to begin doing push-ups and sit-ups at home. I fell off the wagon with the push-ups and sit-ups by mid-February, but was managing to pack my lunch at least two or three days per week up until my heart attack. As a tool of motivation, I took three pictures of myself shirtless when I first started my work-out routine in January. I wanted to be able to track the changes in my body. I did lose some weight in January and February, but had gained it all back by mid-March, right before my heart attack. The day I went biking, in fact, was my attempt to get "back on the wagon." Anyway, I still have those "before" pictures, and maybe once I get down to my target weight in the 190's, I'll post some before and after shots. I'll only be able to suffer the embarrassment of those "before" pictures if I have the "after" pictures to brag about. proud of you. See I do read it. I thought we weren't talking anymore? Would you just say "thank you"? Such a brat! I've had this blog for seven years and THIS is the first comment you leave me, my beloved M? Hmmm...really sweetheart? I think I commented a few years ago. ;). You know how private I am on-line with my comments and how loud I am face-to-face Love. :) I have be protecting my sis since I could speak. You know that better than anyone except for that boy on the bus when I was in 4th grade and I threatened him and called him a "turkey" because he hit her on the head. Well, I am very proud of you, but I knew you could do this. You are a motivation to the rest of us. Excellent, at 38 I am concerned about myself. I ha e been more and more physically active. My diet is not terrible, but not the best. Smoking is the bane of my existence. So congratulations, I am glad you are doing well. I am taking cues and encouragement from this, so thank you.